New South Wales state owned railway. Went through various name changes eg State Rail. In 1997 the passenger section is called "Countrylink" while the freight section is called "FreightCorp". 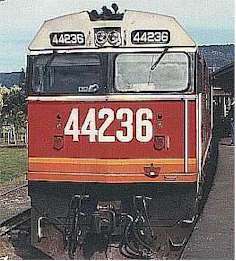 Locomotive class codes for NSW use number groups eg 4462 which is pronounced as Forty-Four Sixty-Two not four-four-six-two. All locomotives are standard gauge. RSC-3 A1A-A1A built at Montreal Loco Works, 1951. 1600 HP #4001-20 Alco 244H V-12 . Out of service 1971. NSW used 40 class for everything from passenger expresses to freighters to local services. Two 40 class units, 4006 and 4002, were sold to Robe River Iron Associates who used them to build and later shunt their iron ore railway in WA. Both 4002 and 4006 are now out of service. GE ALCO Cab units CO-CO with ALCO 244H v12 engine. 1600 HP Built by Goninan, Newcastle, NSW Sept 1956 #4301-4306. Out of service late 1970's. Used for everything from passenger expresses to freighters to local services. DL-500G CO-CO ALCO 251 V12 engine 2200 HP Built by Goodwin , Sydney from 1971. The last 6 had AC alternators as well as built by the replacement ALCO builder, COMENG, Sydney. Box cab full carbody design with a cab at each end. #44201-40. Used for everything from passenger expresses to freighters to local services. All out of service early 1990's. DL541 CO-CO hood versions of the 44 class. Built by Goodwin, Sydney from 1962. #4501-40. Used on everything from passenger expresses to local shunting but mainly freighters. Out of service early 1990's. DL-531 CO-CO ALCO 251 6 cylinder inline engine. 950 HP. Built AE Goodwin, Sydney from 1959. #4801-48165. Built for branchline use as well as shunting. Some times seen on main line services. Many still in service 2001. ALCO 251CE V-12 engine from MLW, Canada. Built COMENG, Sydney. Similar body to 442 class. 2200 HP Introduced 1978. #8001-50. Used for everything from passenger expresses to freighters to local services. Some even made it as far as South Australia where they hauled trains to places such as Whyalla and Adelaide. Some still in service 2001.